There are times when I'm swayed by popular opinion, when I feel that we should be moving this blog in a more literary direction. That the books of the genre that I most enjoy to read and review should be supplemented here by more "literary" works. And then I go and read a book like The Secrets of Sir Richard Kenworthy. And once again, I am reminded that historical romance is indeed, quite literary enough. Sir Richard Kenworthy travels to London to procure a wife. It's not for money, or for status and definitely not for love (at least not in the way we think) that he decides to do this. But we don't know that. And neither does Lady Iris Smythe-Smith. Yes, that's Iris of the Smythe-Smith musicale fame. More on that later. Sir Richard begins a full court press to win Iris' hand after he spots her playing cello in the infamous annual musicale, and when he succeeds after one week and one compromising kiss, they marry by special license and make their way to Maycliff, his estate in Yorkshire. The reader is led to believe that the rush behind Sir Richard's courtship is brought on by his desire to save his estate. The truth, however, is much more insidious. And while Iris suspects that something is not quite as it seems, she at first puts aside her intuition and reservations. What neither Iris nor Richard count on becomes the one thing that may hold them together when the truth finally comes out. And when the truth does surface, in the best confrontational scene I've read in quite some time, be forewarned. Sir Richard is not what he seems, and shows it in some shocking ways. The change in him catches Iris, and Ms. Quinn's audience by surprise. When he then asks Iris to make the ultimate selfless sacrifice for the sake of his family, we are left breathless. What will Iris do? And no, I'm not going to tell you. Not even a hint. The plot twists will be enough to keep you turning the pages until the only thing left is your sigh of satisfaction and the thought that you'd prefer this story to never end. Julia Quinn started using the annual musicales as a plot device in her earlier novels (the acclaimed Bridgerton series) but her quartet of books featuring the cousins of the Smythe-Smith family, and how they, one by one, have found love, are the best of her efforts in my opinion. And this book tops them all. 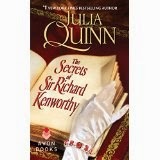 Family loyalty, angst, betrayal, and ultimately, love, all wrapped up with the humor present in all of Ms. Quinn's novels, make The Secrets of Sir Richard Kenworthy quite worthy of your time. I loved this book and I highly, highly recommend it. It is definitely this genre at its best.